This mod was originally created by AUTOMATIC_MAIDEN, ported to 1.7.2 by asie, then maintained by Pokefenn and Cricket. It is currently maintained by tterrag, Drullkus, and minecreatr. It is a fork of the "Chisel 2" project, and is fully compatible with worlds that were created using that mod (1.7 only). NOTICE: Chisel now requires a library mod, CTM. Please install this before updating to 0.0.11+. Chisel now has a Discord server! Chisel adds a huge variety of decorative blocks to the game. The mod is very useful for people who like the construction aspect of Minecraft. Access to new blocks is provided mostly through one tool, the chisel. 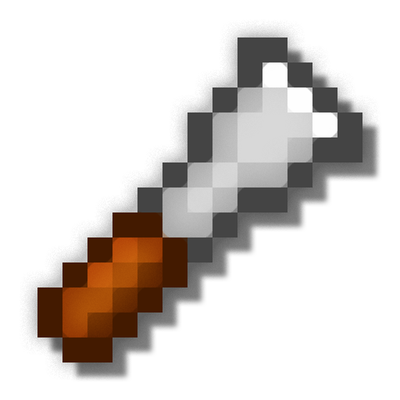 The iron chisel is created with a iron ingot and a stick in a diagonal pattern. Right clicking opens the chiseling interface. Place a block in the chiseling slot (top left) and you may turn it in the same group. Chisel also adds another tool called the Ender Offset Wand. Some blocks such as the Factory Block's Massive Fan has a texture that spans over multiple blocks. The Ender Offset Wand can be used to shift a texture up or down and left or right. Please report bugs on the issue tracker! Chisel is licensed under GPL2. Chisel is free to use in any modpacks, without permission. You can find the latest experimental releases on tterrag's Jenkins. Cricket: Maintaining mod for 1.7.10. Update forge. You are *way* behind. How can I craft your new Iron Bars? 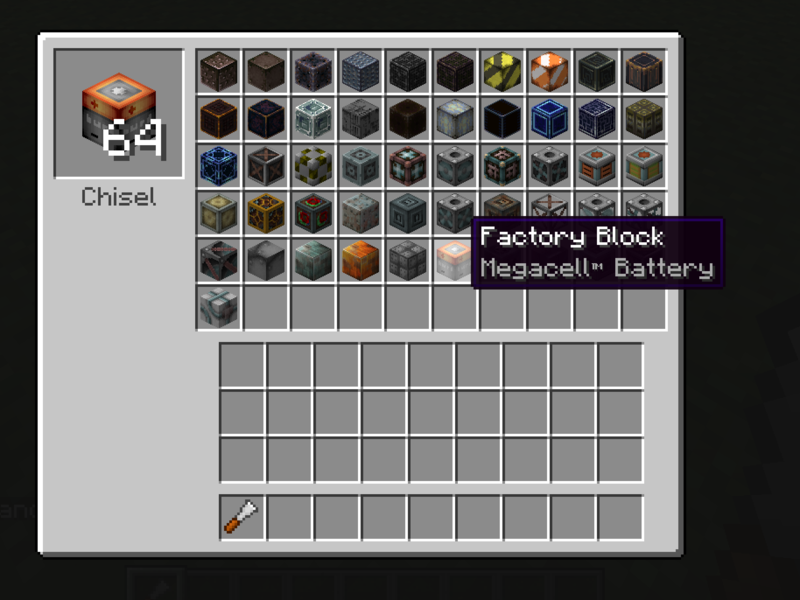 With normal Iron Bars and all 3 chisels, I can't change it. *sigh* fix going up for this now. Great mod!, Ive used it in all my modded playthroughs! Although, I have been having an issue where most of the blocks- marble, Limestone, factory, etc, aren't textured. it seems to only be the blocks added in the mod, because chiseled stone, bookshelves, and all chiseled vanilla blocks are fine. Is there a way to disable some blocks? Like the factory ones? I don't think so. You might have to ask the creator. But, why would you want to disable them? Because I have a personal medieval server with my friends. I don't want electricity in my world. Then just don't use the blocks. In would still like to disable the blocks, just to make sure my friends don't use them. There are configs for all the blocks. Look it up. There are many great tutorials out there. Please bring back iron bar and glass pane chiselling. It looks kinda weird using full blocks in windows after years of using panes. hello i installed chisel and the textures are missing can you help ?? cdo: Unable to fit: minecraft:blocks/lava_flow - size: 32x32 - Maybe try a lowerresolution resourcepack? OpenGL: AMD Radeon(TM) R3 Graphics GL version 4.5.13492 Compatibility Profile Context 22.19.677.257, ATI Technologies Inc.
You have to download the required library.